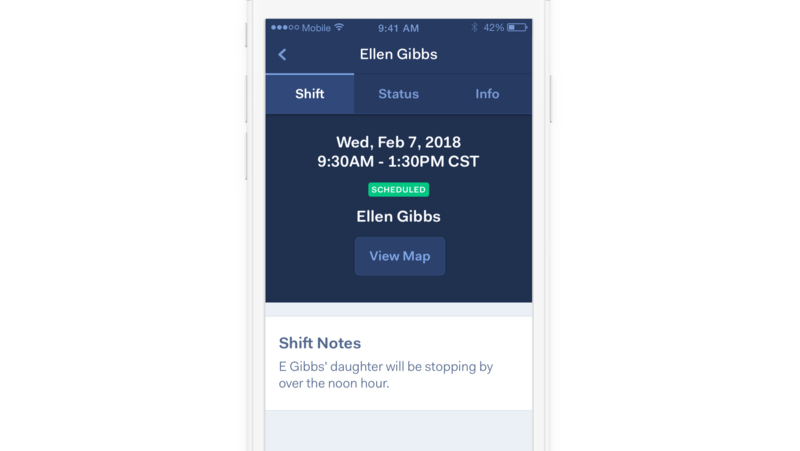 You can now add a note to any shift to share special instructions with that shift's caregiver. 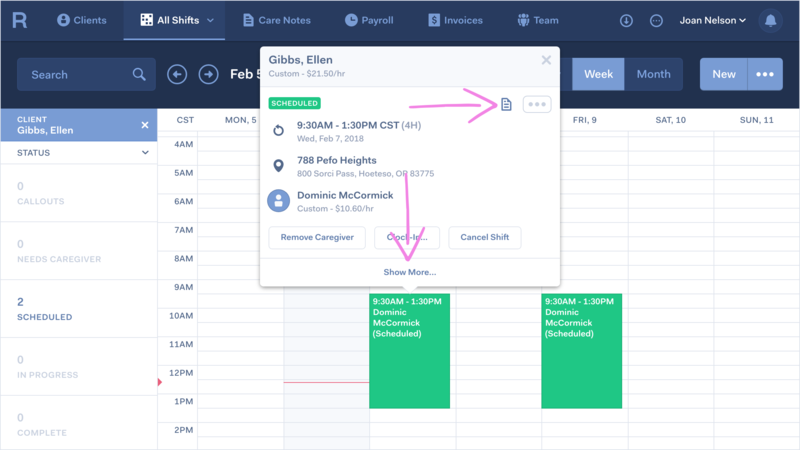 To do so, view the full shift details by selecting "Show More..." if the shift details doesn't automatically open. If the shift has a note, you'll see that icon in the top right of the shift preview. When viewing the shift details, you can add a note and we'll show you when the shift note was edited last. Caregivers see the shift note at all times when working the shift, at the top of the care tasks list. You can now add a cancellation reason when cancelling a shift. Just like the new shift notes, you can view and edit cancellation reasons in the shift details view. Carespaces have locations, and locations have a name, address, optional geo-fence and optional location notes (e.g. where to park, entrance instructions, etc.) 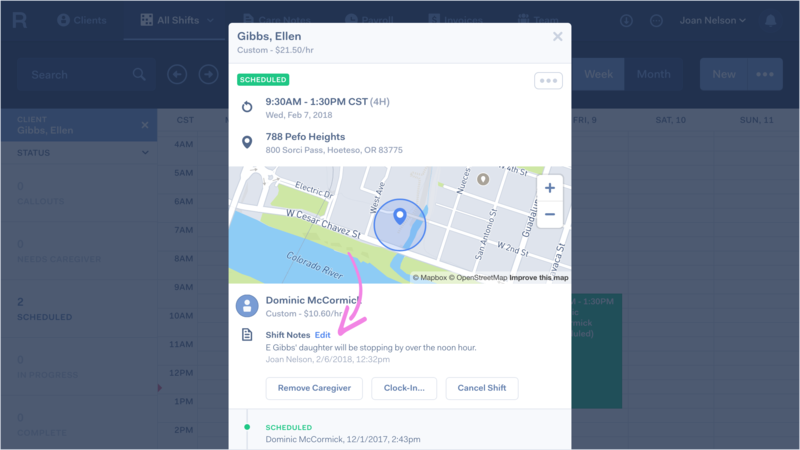 Before, caregivers could only see the location notes if they select View Map when working their shifts. Now in 3.0.12, caregivers will also see those location notes while clocking into their shifts. We've added two new sheets to the shifts export. Cancellation reasons will be included in a new sheet if you want to run a report and save those reasons why scheduled shifts did not occur. Since the All Shifts export uses the view's filter, you can filter by a client if you want to export the cancellation reasons for just that client. The other new sheet shows totals for the export: the number of clients, caregivers and shifts included in the export, as well as an hourly breakdown by shift status. This report is useful should you want to see how many hours you have scheduled for a given month, week or day. In Settings > Business Profile, there is a new Business Email input that gets used as the reply-to address for your organization's outgoing emails. If caregivers reply to any of these email notifications, you'll now receive replies at that address. This email address is also getting used as the reply-to on sent invoice emails. Note: When going live with this feature, we set the reply-to email address to a recently active admin from your organization. We recommend verifying that the right email address is being used.